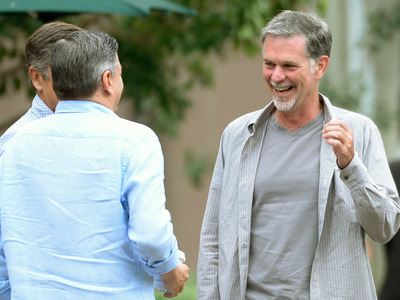 Netflix CEO Reed Hastings is worth $1.29 billion but he doesn’t even have his own office. The reason isn’t some nod toward egalitarianism, or a need to feel in the midst of his employees, but rather that he simply doesn’t need one, he told The New York Times. “My office is my phone,” Hastings said. Part of why Hastings has no need for an office is because he’s often on the go. He told Fortune he spends 3 to 4 nights in LA a month, and has been doing a lot of international travel. But it says something about the way Hastings thinks that he’s chosen to ditch his office. Obviously he could have one, even if just for things like meeting a Times reporter. But that wouldn’t be the most efficient use of Netflix’s resources.